Budapest public transportation is in relatively good shape compared to other major cities in Europe. 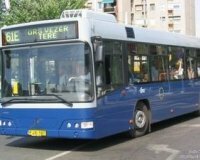 The public Transport company is called Budapesti Közlekedési Vállalat (BKV). Unfortunately, getting from the airport to the city by public transportation is rather slow. You have to take bus 200 to the Kőbánya-Kispest terminal, then metro #3 to the city center. The journey takes about 45 minutes altogether. Buses, trams, trolleys, suburban train, 2 metro lines and a millennium underground make up the public transportation system in Budapest. Most run between 5 a.m. and 10 p.m., while the most important trams and buses run non-stop. One of the main lines is tram 4-6. It runs from Moszkva square on the Buda side, crossing to Pest on the Margareth Bridge, then all the way along the main ring, and back to the Buda side on Petőfi bridge. It's a non-stop line, with buses running instead of the trams during the night. Tickets can be purchased from vending machines in the stations, from newsstands near the stations and from the official BKV ticket offices. Tourists should consider purchasing daily, weekend or weekly passes, not only to save money, but also to save the trouble of having to purchase tickets for every boarding. During the past years, ticket control became much stricter. Locals used to make a sport out of traveling without a valid ticket, but nowadays security personnel block anybody without a valid ticket at the metro stations from entering, and night lines are also frequently patrolled.